If you face Scottsdale criminal or DUI charges, contact James Novak, Scottsdale Criminal Defense Attorney as soon as possible. James Novak at The Law Office of f James Novak will provide you will a FREE consultation for criminal or DUI matter. James Novak devotes exclusively 100% of his Law Practice to defending DUI and Criminal Cases. 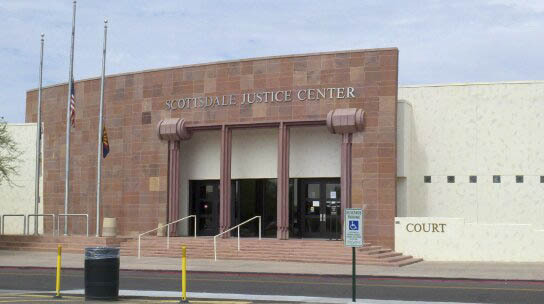 James Novak defends criminal and DUI charges frequently in the Scottsdale Courts. James Novak has handled hundreds of Scottsdale Criminal and DUI charges successfully over the last decade. He defends and litigates charges for his clients in Scottsdale Court on almost a daily basis. He is also a former Maricopa County prosecutor. He is very familiar with Scottsdale Courts, protocol, procedures, judges, prosecution and laws. James Novak is especially well versed and skilled on the defenses that can help you get a good outcome in your case for Scottsdale, Arizona criminal or DUI charges. If you received Scottsdale Criminal Charges or were arrested in Scottsdale you were given or mailed a Complaint or Citation. That documentation will indicate the important information about your court appearance. It will provide name of court, time and date you are required to appear. If you have not hired an experienced private practice Arizona criminal defense or DUI defense firm that defends Criminal and DUI cases in Scottsdale, then you must appear as instructed. A critical mistake people sometimes make is ignoring or failing to appear for their court date on the designated date and time. If you fail to appear as instructed on the complaint, a warrant will be issued immediately for your arrest and once found, taken into police custody. If you have hired a Criminal or DUI Attorney, like James Novak who defends cases often in Scottsdale AZ, he will give you further instructions as to when and if you need to appear for that court date. He will inform you on the next step, discuss all the facts, processes, protocol, nature and classification of the charges, direction, what needs to be done. He will advise you of what he will do to begin building a strong Scottsdale Criminal Defense as your defense attorney. He makes himself very accessible for questions and concerns and he will be available to address them. James Novak feels that an open line of communication with his clients is crucial to the success of the defense outcome. He recognizes that a criminal or DUI Charge in Scottsdale is a very serious and devastating matter in your life and he treats that way. Remember a DUI or Criminal Charge in Scottsdale is not yet a conviction. In fact criminal and DUI charges are dismissed with good Scottsdale Legal Representation every day. You may have been arrested or charged, but that in and of itself does not “convict” you or make your “guilty” of that crime. Your Constitutional Rights allow you the right of fair treatment under the law and to retain counsel of Criminal Defense Attorney––Use it! Another mistake people make is not exercising that right. To go unrepresented by a good private practice defense attorney who defends cases in Scottsdale, AZ is the fastest way to get a conviction. You will need an experienced Criminal and DUI defense attorney to defend your case. Scottsdale Prosecution and Scottsdale Court will not do anything to help your defense. They want criminal and DUI convictions. They may present themselves very professionally, polite, and appear to be helpful. But they are looking for an opportunity for you to incriminate yourself further, to make their case against you stronger, and to try to persuade you to go unrepresented by a private criminal defense attorney in Scottsdale. Why? Because it makes the prosecution’s job easier when a defense attorney in Scottsdale is not challenging evidence or the charges or defending you. Not retaining a private practice criminal defense or DUI attorney in Scottsdale is the fastest route to a conviction. Another case of their heavy case load closed in the prosecutions favor. Only a good private practice Arizona Criminal Defense Lawyer, like James Novak, who defends DUI and criminal charges in Scottsdale, AZ will vigorously defend you. James Novak will gather and examine the evidence, determine if your constitutional rights have been violated, look for flaws or weaknesses in the prosecutions cases, comb through and challenge evidence, defend the charges, and customize an effective defense strategy on your behalf. He will fight to suppress all evidence, get your charges reduced, and work for a dismissal of your criminal or DUI charges completely. Without a private practice Scottsdale Criminal Defense and DUI Defense Attorney like James Novak, your chances of getting a good outcome on your case drastically increase. One of the keys to a successful Scottsdale Criminal defense is to get your Scottsdale Criminal Defense Attorney on board as soon as possible. Call James Novak today and let him begin building you a strong and successful defense: (480) 413–1499.